The fake website set up by the Securities and Exchange Commission contains many of the elements — including a countdown timer — that cryptocurrency scams use to pressure consumers. The Securities and Exchange Commission launched a spoof cryptocurrency website on Wednesday to warn investors about the risks of participating in "initial coin offerings," or ICOs. The website — called "HoweyCoins.com" — mirrors marketing materials published by actual cryptocurrency promoters. It includes a countdown timer, promises of outsized investment returns, and even a "Meet the Team" section with SEC employees posing as cryptocurrency developers. When visitors click a button that reads "Buy Coins Now!" 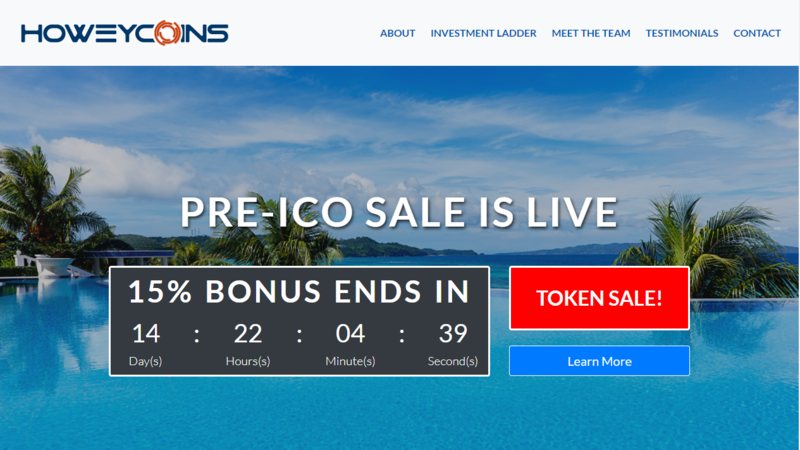 they are routed to an Investor.gov site that breaks down the spoof and outlines how each element is commonly used to trick unsuspecting investors in ICO schemes. Initial coin offerings are a way for upstart cryptocurrency firms to raise large amounts of money. In a typical ICO, inside investors are offered the first chance to buy a new cryptocurrency before it hits the market. HoweyCoins is part of the SEC's effort to combat an explosion of scams and securities fraud associated with cryptocurrencies. The regulator is taking a multi-pronged approach to consumer protection, educating the public about the risks of unscrupulous ICOs while simultaneously bringing enforcement actions against and investigations of the worst offenders. A statement from the SEC says the agency "was able to build the HoweyCoins website in-house in very little time, which demonstrates just how easy it is for someone to create a scam opportunity." "At the end of the day, we're never going to be able litigate our way out of investment fraud. It's going to come down to investor education," said Lori Schock, director of the agency's Office of Investor Education and Advocacy. The name "HoweyCoins" is a reference to the Howey Test, a four-part legal test issued by the Supreme Court in 1946 for determining whether an investment counts as a "security." Generally, if something passes the Howey test, and is therefore considered a security, it is subject to SEC regulation. The SEC claims that many of the cryptocurrencies launched with initial coin offerings in recent years pass the Howey test, and it has relied on this interpretation as a legal basis for its enforcement actions. In 2017, the regulator established a dedicated cyber unit tasked with combating financial crimes and "cyber-related threats" to investors. The unit targets ICO scams as well as frauds involving social media, the dark web and data breaches. But enforcement can only catch bad actors after the damage has been done. Once lost, investor money is often extremely difficult to recover — even if the agency is able to successfully shut down the scam. According to Schock, investor education can help consumers identify risky cryptocurrencies before they lose their money. To her, the HoweyCoins site is a fun way to get that message out. "The currency may be virtual, but the pain is real," she said.